Do you want to know if is it safe to delete hiberfil.sys and pagefile.sys? Check this quick tutorial about how to do it safely and quickly. Today, RAM is quite cheap, or at least at the time of writing this guide. This implies that it is reasonable to build computers with enough RAM on the computer and that it is not nonsense to have a desktop with 16 GB of RAM or more. But on Windows systems having a lot of memory in the computer reserves an amount equivalent to RAM in disk space. In magnetic hard drives with sizes currently, one terabyte to 4 terabytes isn’t very painful. But in solid-state “hard drives,” fast SSD, this can be a problem since the most common size of these disks ranges from 64 gigabytes to 256 GB. On a computer with 16 GB of RAM, you can easily subtract 32 gigabytes or more. What causes this hijacking of disk space is the virtual memory service and the power off in hibernation. The first one needs a file called pagefile.sys in the root of the hard drive where it hosts Windows. Typically C: The second service uses the file hiberfil.sys that is in the same place. When you turn off the computer, a dump of the memory is stored in the file, which will be used again to restore the computer when you turn it on again. Virtual memory is essential for the proper functioning of the operating system. Therefore you must weigh whether it is convenient to delete or reduce the file pagefile.sys. But in my current computer and in the conditions in which I usually work, with 16 GB of RAM, I can entirely dispense with it, and even perceive an improvement in the overall performance. By contrast, the hibernation service is, for many users, irrelevant on a server or desktop computer. It is more oriented to portable computers. Although even in them it is more frequent to use the suspend function than to hibernate. In this case, remove the hibernation service is convenient. If you want to see what these files occupy in your computer, you must open Computer in the Start button menu. Open the disk that contains Windows. Usually the disk C: The most likely thing is that the files are not shown to be of the system and are hidden. To show them you must go to Organize > Folder and search options. In Folder, options click on the View tab. And in Advanced Settings, mark Show files, folders, and hidden units and uncheck Hide protected operating system files. Finally, click on Accept. Now you can see the files hiberfil.sys and pagefile.sys. After checking the space occupied by the files. Now that you know what the hiberfil.sys and pagefile.sys files are, you can free up the disk space by deleting or adjusting the services that require them. You can choose between removing or reducing its size. The complete removal could cause the system in some situation to run out of memory. This, in any case, is recommended for computers with enough RAM. Not supported on machines with less than 6 GB of RAM. If something wrong happens, the process is entirely reversible and you can recreate the pagefile.sys file. Press the Start button, and in the text box type system. The search will show you apps or documents. Double click on the app that is grouped under the control panel called System. On System properties, you go to the Advanced options tab. In Performance press Settings. Another window will open, and you need to click on the Advanced options tab. You will see an area called Virtual Memory with a button called Change… that you need to click. 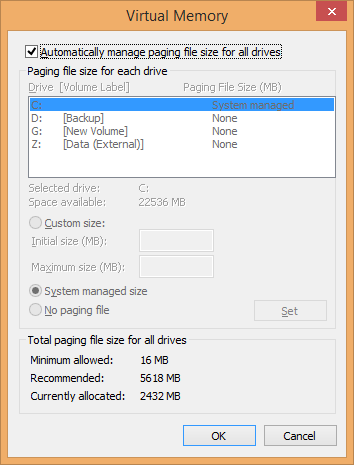 In Virtual memory, you can define the size of the pagefile.sys file or delete it entirely. Once the changes are decided, click on Set” after which you must restart the computer. With the same steps, you can re-adjust the pagefile.sys file if the new configuration isn’t satisfactory. The need for the hibernation function is almost certainly unnecessary for most users. In totally remote desktop computers, since these start quite fast. More if the laptop has SSDs or abundant RAM. It is even possible that your computer doesn’t have this file and therefore lacks the hibernation service. So you may not find hiberfil.sys on your computer’s hard drive. Click on the Start button and in the search box type CMD. As you need to open it as an administrator, click on the right button to display the context menu. Press Run as administrator. What do you think about deleting hiberfil.sys or pagefile.sys? Do you perceive some improvement? Let me know in the comments section.